The following is a guest post from Zen Faulkes of NeuroDojo. Dr. Zen is a participant in the #SciFund challenge. If you have ever written anything, you know that is a decent amount of writing. That’s how much I write for a description of a research project in a typical grant proposal. And the project description is just the starting point. There is the budget, the justification for all the items in the budget, the biographical sketches of many of the individual participating in the projects, the one page summary, and more. The last proposal I submitted was 55 pages all told, and almost all of it was single spaced. The size of grant proposals like this, and the effort needed to write them, demonstrates the need for projects like the SciFund Challenge. I am not complaining about having to write that much, because when I do write those proposals, I ask for a lot of money. 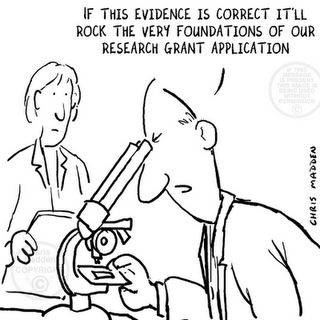 My grant requests are often hundreds of thousands of dollars. The problem is that grant proposals and funding agencies are almost invariably set up to handle large amounts of money. Before you give someone hundreds of thousands of dollars, you want to make sure they have a good plan. You want accountability. The problem is that funding agencies are only set up to deal with large amounts of money. What if I don’t need hundreds of thousands of dollars to grease the wheels on a project, but only a few thousand? I still have to write a single spaced, fifteen page description of my project. And it isn’t just funding agencies, either. Once you get the money, institutions also want to make sure that they have processes to ensure large pots of money aren’t squandered. This is reasonable. But the system doesn’t deal with small purchases easy. The same purchasing procedures are used for both a piece of permanent equipment with a six-figure sticker priceÖ and roll of tinfoil from the local grocery store. Not every project should be a “Go big!” project. That’s just one reason I’m excited about the #SciFund Challenge. What a refreshing article, just to put a good flavor to the dinner and sit another time at the computer with renewed vigor.